We previously developed an in vivomouse prostate reconstitution (MPR) model of metastatic prostate cancer using p53 ‘knockout’ mouse urogenital sinus tissue for retroviral transduction of rasand myconcogenes (Thompson et al., Oncogene, 10, 869, 1995). We further demonstrated contrasting responses to transforming growth factor beta-1 (TGF-β1) in three matched pairs of early passage cell lines derived from primary prostate tumors and lung metastases generated by this model system (Sehgal et al., Cancer Res, 56, 3359, 1996). In this study we tested these cell lines for growth potential in subcutaneous and orthotopic (dorso-lateral prostate) locations and metastatic activities in both spontaneous and experimental assays. Subcutaneous and orthotopic tumors produced by cell lines derived from metastatic lesions tended to grow less rapidly but demonstrated greater spontaneous metastatic potential than the cell lines derived from primary tumors. In contrast all cell lines produced lung colonies in an experimental metastasis assay (tail vein inoculation) with the primary tumor-derived cell lines yielding higher activities in two of three matched pair analyses. 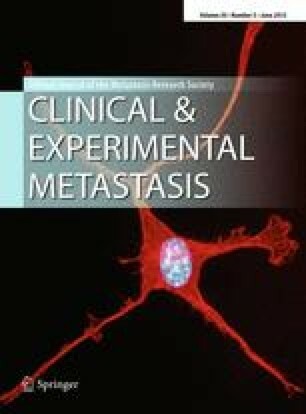 The ability of all cell lines to produce lung metastases in the experimental assay, while only the metastasis-derived cell lines retain the ability to initiate and complete the entire metastatic pathway in the spontaneous assay, suggests that intravasation may be the rate-limiting step in metastasis in this model system.